Ishidai (Oplegnathus fasciatus) | Better Know a Fish! Did this little fish really survive a tsunami and a two-year journey across the Pacific Ocean? This is a juvenile specimen of Oplegnathus fasciatus which found itself on a beach in Washington state in the United States at some time on March 22 this year. More specifically, it arrived inside the holding tank of a boat — an 18-foot (5.5 m) skiff from Japan named the Sai-shou Maru — that was washed into the ocean two years ago during the 2011 Tohoku earthquake and tsunami. Dubbed by locals as “the tsunami fish”, many people have been puzzled by how this six-inch fish became a stowaway in the holding tank of a skiff (with four other fish), and how it could have survived a two-year journey from Japan. So did it? Let us look up the biology of this fish and take a guess. Oplegnathus fasciatus may be a stranger to these waters, but it is quite the prize in its native waters around Japan, Korea and China. In Japan, it is known as ishidai, which translates into “stone porgy” or “stone perch” (Jordan and Fowler 1902). It also has a preponderance of English names — barred knifejaw, striped beakfish, striped beakperch, false parrotfish, Japanese parrotfish, rock bream — so I will just call it ishidai here throughout for simplicity’s and coolness’ sake. A quick search around The Google turned up a few important notes. First, ishidai are not exclusively found in East Asian waters. The FishBase country list references for the species also lists Hawaii and Midway Atoll as its native distribution, as do photos and anecdotes from hobbyists. So, it is quite possible that as the Japanese skiff drifted past Midway and Hawaii, it was at some point upside-down and then tossed and turned in the waves, so that when it became righted again, its holding tank managed to fill up with seawater — and some sea creatures. That leads us to the next question: our little ishidai is now six-inches long. How old is it? Is it old enough to have begun its voyage from Japan, or is it simply too young — which means it must have boarded the skiff somewhere along the debris path in the Pacific Ocean. Fortunately, it seems that ishidai is being explored as a mariculture species in Asia due to its high value in the seafood trade, and another search on The Google also returned a plethora of research papers on the rearing of ishidai. This is where the internet got fun again. There was all sorts of research on ishidai. Do they grow faster if you feed them vitamin C? Can you feed them soybean meal instead of fishmeal? And I kid you not — can they learn to solve new problems in a maze? A lot of the literature, as expected, was from journals in Chinese and Japanese, and ones hidden in non-English databases and websites with only sporadic abstracts in English. But many of them only investigated growth rates in ishidai embryos and fry, and the experiments stopped when the fish got to be about 1 inch (2.5 cm). Finally, I found it. A 1997 paper from Japan reporting that 14-month-old ishidai measure about 14.9 cm. Thank you, Messrs Tsuchida and Tabata (1997). Oh, and what might 14.9 cm be in inches? Why, it would be about 6 inches. I will defer to an oceanographer to estimate where the skiff might have been 14 months ago (Addendum: 14 months or less; it takes ishidai 40 to 60 days to even get past 1 inch in size). And there are other ways scientists can discover the origin of our little traveler. Comparisons of DNA or stable isotope ratios with ishidai from different areas, perhaps. There are other ishidai puzzles out there, too. There is even a report of two live ishidai seen swimming in the waters off Malta — as in the Malta in the Mediterranean Sea (Schembri et al. 2010). And we never got around to talking about why it has all these crazy English names like “knifejaw” or “beakperch” (because it has some very weird fused teeth). Tsuchida, S, S Tabata. 1997. 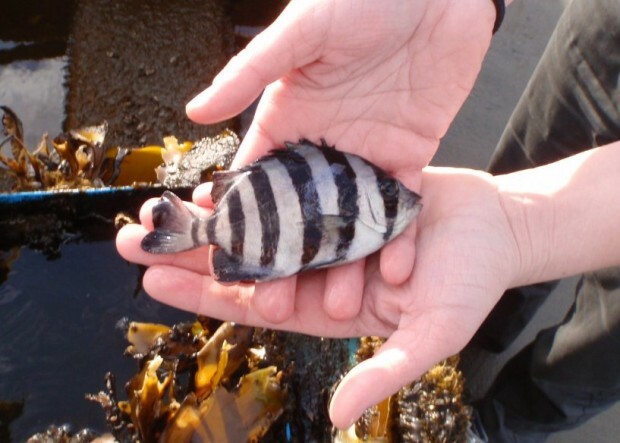 Changes of the preferred temperature in striped beakperch, Oplegnathus fasciatus, during the juvenile growth. Nippon Suisan Gakkaishi 63(1): 64-69. This entry was posted in Actinopterygii, Marine Fish, Perciformes, Random Fish Videos Set to Crazy Soundtracks and tagged aquaculture, barred knifejaw, foodfish, ishidai, Japan tsunami, knifejaws, Oplegnathidae, Oplegnathus, Oplegnathus fasciatus, Pacific Ocean, Perciformes, rock bream, striped beakfish, striped beakperch, tsunami fish. Bookmark the permalink.